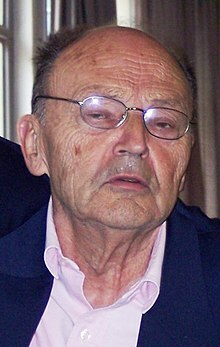 Michel Tournier (19 December 1924 – 18 January 2016) was a French writer. He has won awards such as the Grand Prix du roman de l'Académie française in 1967 for Friday, or, The Other Island and the Prix Goncourt for The Erl-King in 1970. He was a member of the Académie Goncourt. His autobiography has been translated and published as The Wind Spirit (Beacon Press, 1988). He had been named as a contender for the Nobel Prize in Literature. He was born in Paris, France. Tournier died on 18 January 2016 in Choisel, France at the age of 91. ↑ "Nobelpristagaren klar redan i morgon". DN.SE. Retrieved 19 January 2016. This page was last changed on 27 September 2016, at 16:11.